The press were available prior to the press conference to conduct interviews after a round of quick introductions. The event attracted local media, including the Los Angeles Times. 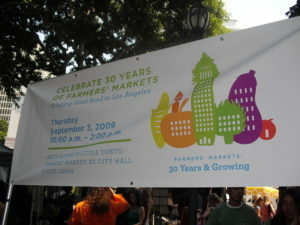 The celebration focus was “Farmers’ Markets: 30 Years and Growing.” We addressed the past, present and future of farmers’ markets in L.A. and beyond. The “We” included Vance Corum, who served in lead role to organize the event. I joined many of my colleagues from the founding days of the farmers’ market movement in Los Angeles: Mark Wall, Gretchen Sterling, the Cabral Family (egg producers), Vicky and Vince Bernard (family farmers), Jim Churchill and and Lisa Benneis of Churchill Orchard, and others who are among the shakers and movers today in L.A.’s world of food system change, including Tracy Houston (founder of Menlo Lab Communities), Mia Lehrer (award winning farmers’ market designer), Ali Bhai and Nat Zappia (leadership of Garden School Foundation), Kurt Floren (Los Angeles County Agricultural Commissioner), Pompea Smith (CEO of Sustainable Economic Enterprises of L.A.), Robert Gottlieb (Director of Occidental College Urban & Environmental Policy Institute), and more. One delightful encounter at the event was meeting the Afghan family that owns Bolani East and West Gourmet Foods. Based in Concord, East and West Gourmet Afghan food typifies a great Farmers’ Market success story. Bolani Matriarch Bilal Sidiq and her family immigrated to the United States from Afghanistan and has created a delicious line of fresh, organic, and vegetarian foods. Turns out Bilal and her family business are well known in Bay Area farmers’ markets. Mayor Antonio Villaraigosa gave a 10-minute high energy address culminating in an announcement of a taskforce being created to study the formation of a Los Angeles Food Policy Council and an assessment of our foodshed stretching from San Luis Obispo to San Diego and inland. At one point during the presentation he actually hopped back and danced on one foot. Bless this brand of Mayor who gets so worked up over farmers’ markets. Are you surprised that Los Angeles County now has more farmers’ markets than another in the State? As President Obama once reflected in health care discussions, a farmers’ market at the White House would have been a good idea to move some of veggies out of the White House garden and help highlight and sustain a few local farmers. We need our President to be willing to talk about farmers’ markets. 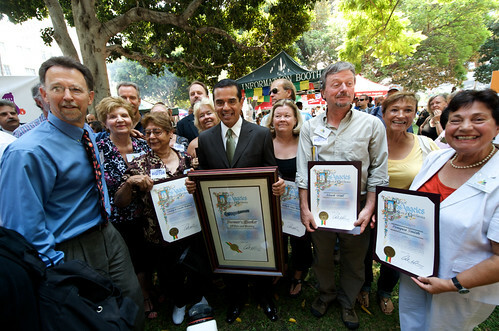 I’m thankful to Mayor Villaraigosa for setting an example – we need all mayors to put the pressure on Congress to insure that programs like the USDA Farmers’ Market Promotion Program (FMPP) expand – not get cut by short-sighted pressures from the processed food industry. At the event, we were encouraged to speak about the FMPP program and other efforts that will encourage the improvement and expansion of farmers’ markets. We were asked to talk about what motivates us to farm or manage or attend markets – and share any reflections that might help educate consumers: reconnecting people to the food system, the soil, the environmental impacts, reducing our food carbon footprint, addressing the obesity epidemic, challenging the health care system toward preventative care through proper nutrition, or other concerns. 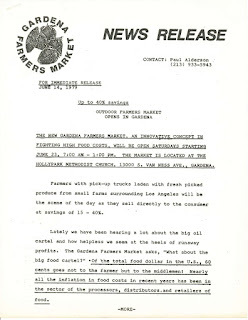 I was fortunate to be at ground zero of the farmers’ market movement in California and serve as one of the first full-time organizers of farmers’ markets in Los Angles—back in 1979. The first markets were all organized in low income communities. This is where we saw the greatest need 30 years ago, and today, this is where the greatest need remains. Now we may have now use exotic lingo like “foodsheds,” “food deserts” and “food system change.” But, despite our evolving awareness and lexicon, and despite enormous progress, our evolution of knowledge about the food system has not put an end to the dysfunction that continues to foster hunger, malnutrition, disease, and profound levels of metabolic disease and health disparities today. Food deserts are now food swamps. While the poorest communities suffer the most, we are all living in the ultra-processed food swamp. We still have much work to do. Notice in the press release above, written almost four decades ago, that we were advertising a 15-40% savings to shoppers at the farmers’ markets. In general, farmers’ markets are no longer a guaranteed bargain, in fact, you may now expect to pay a premium at some farmers’ markets, especially in urban areas. This makes the job of sustaining farmers’ markets in low-income communities even more difficult (having to compete with upper-income communities that are willing to pay higher prices for farm fresh food). In today’s world, for a variety of reasons, it is more challenging than ever to bring solutions like certified farmers’ markets to low-income communities. Farmers markets, now popular in so many communities are generally no longer associated with bargain prices, despite eliminating the middlemen from the equation. There is a lot more competition from other community based markets, and fewer local farmers to recruit. Mark Wall was among a short list of my colleagues present at the event who helped initiate the farmers’ market movement in L.A. several decades ago – and continued on without stopping to present day. He says that that “what we need, is what we once had, more risk and experimentation and creativity to create a better food system that solves the old problems and some of the new ones.” Mark currently works for a market in Westwood that is designed to serve Veterans – click here to visit the Westwood Farmers’ Market website. Vance Corum is another one the amazing “lifers” who have committed their lives to food system change. 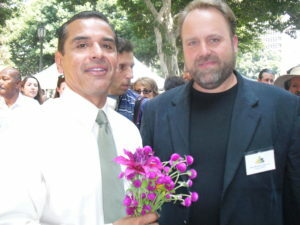 Vance was a key ringleader of the event in Los Angeles and has demonstrated a life-long commitment to developing farmers’ markets in the U.S. I admire his leadership and passion that is driving efforts to increase funding for programs like the USDA Farmers’ Market Promotion Program. 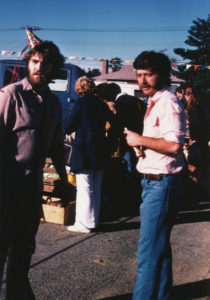 Vance was among the authors who wrote the “The New Farmers’ Market: Farm Fresh Ideas for Producers, Managers, and Communities.” Back in 1979, Vance secured a position with the California State Direct Marketing Program and I was hired by the Interfaith Hunger Coalition. 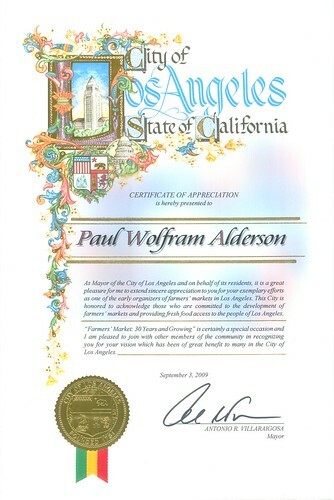 We worked together for several years organizing the first markets in the Los Angeles region. While this was a seminal experience in my career, and my work has taken a few segues in social service since then; Vance plowed on through several remarkable decades of work in this field demonstrating exceptional lifelong leadership in his service in the farmers’ market movement. Ideologically, our ideas about food and foodsheds must evolve so that the most vulnerable among us are not left out of the important changes we are making happen. One of the most important ideas about the food system is that OUR FOOD SYSTEM CONNECTS ALL OF US…however it is not blind to race, income, and social status. The food system change movement must retain a strong sense of social-justice and avoid elitism, regardless of whether it is intentional or not. How can we establish that the availability of healthy food solutions such as farmers’ markets is directly linked to community development and revitalization? Farmers’ markets can have a positive impact on multiple levels including health, economy, environment, and social and cultural conditions. It would be great to have case studies readily available in each of these areas – so that advocates, city governments, and other decision makers do not have to look very far to prove these values. Farmers’ markets provide a community based solution to deficits in the food system – the numbers of farmers’ markets have been increasing steadily for decades. Farmers’ markets are known for making municipal centers more visitor friendly and reinforce pedestrian habits, and for increasing tourism and community pride. What are some of the greatest examples of this? The availability of a farmers’ market and local sources of fresh food are considered influencing factors on quality of life when selecting a city to live in and are considered positive elements in preserving local agriculture, revitalizing urban centers, and for attracting new residents to the city. I would love to see quantitative data on this be more readily available to city planners and realtors. Food interest is high in all cultures, and farmers’ markets are a well-established historic and global solution that provide natural settings for diverse groups of people to experience food and culture in positive social settings, celebrate and build community, promote a sense of accessibility and provide communal space for diverse groups of people to gather, speak multiple languages, and build cross-cultural linkages in a positive, health oriented setting. Farmers’ markets are good for youth development, providing opportunities to learn where their food comes from and meet food producers, offering job training and professional development opportunities (youth employment, service learning, college internships, etc.). It would be great to have a list handy of programs that do this. Farmers’ markets are good for the environment and decrease the carbon footprint of consumers and the city overall by reducing the need to drive outside of the city for fresh food. Is there quantitative data on this? Approximately 50 years ago in the united states, most foods were generally consumed within close proximity to where they were being produced and or packaged, while today, food typically can travel approximately 2,485 miles from farm to table. Farmers’ markets are good for public health, promoting access to nutritious food and lack of access to nutritious food is linked to poor diets, obesity and diet-related diseases. I would love see a website where this type of data would be featured. Fruit and vegetable intake is likely to be encouraged when farmers’ markets are closer, providing special programs like the WIC program and food stamps/EBT and offer a positive step towards fulfilling the who’s “5 a day” recommendation. Farmers’ markets are good for improving food security and access for citizens of all income levels, adding to the general availability, accessibility, and affordability of nutritious and safe foods in the community. It would be great to see research establishing these benefits available on one clearinghouse website. One of the many farmers’ markets I have been a lead organizer for is the East Palo Farmers’ Market. East Palo Alto has a rich agricultural history. Farmers’ markets encourage local growers, farmers and gardeners, with diverse ethnic and social backgrounds, to share food grown in the local foodshed including farms, backyard gardens, and school gardens. Many communities have similar histories. Wouldn’t it be great to see these agricultural histories featured in a more high profile manner? The achievements of this effort as an initiative that was started by the Ruben Abrica, Mayor of East Palo Alto, and the progenitor of the East Palo Alto Community Health Roundtable, a collaborative group supported by Collective Roots (nonprofit sponsor), the Ravenswood Family Health Center, the Get Fit EPA Collaborative, and numerous other community based organizations. Formal municipal endorsement is crucial to the achievement of long-term sustainability of this effort. City governments should require all city departments to support farmers’ markets by providing interagency cooperation, waiving fees when appropriate, and eliminating the need for additional temporary use permits. Local school districts also have an important role. Many low income children rely on the food they receive at school as a leading source of nutrition. School gardens and farm to school programs should be considered essential elements of school district wellness plans. County and State government also have an important role. Recognition and endorsements of local community efforts to create food system change should be offered and encouraged. The Mayors in L.A., San Francisco, and Oakland are among the growing list of Mayors who see political futures in promoting farmers’ markets because they are places that bring together community, health, and culture. This should be communicated and endorsed by County government, State Assembly Members, State Senators, U.S. Representatives, U.S. Senators and any other appropriate government or community leaders.